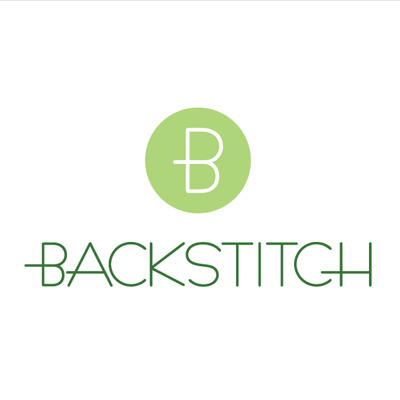 There's nothing quite like the arrival of a new baby to get me panic sewing, and to hear that my dear friends had had their baby, rather alarmingly, on the living room carpet (and almost on the drive) got me to that machine quicker than you can say 'clean towels and hot water'. 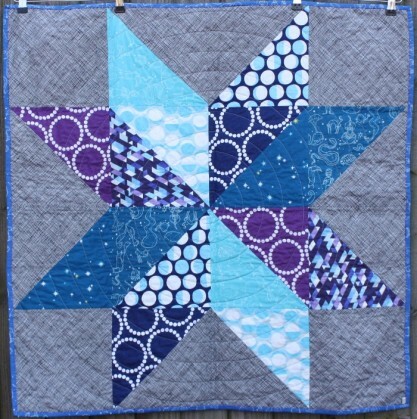 I used Turquoise Linen Cotton Blend to back it and Purple Constellations to bind it. 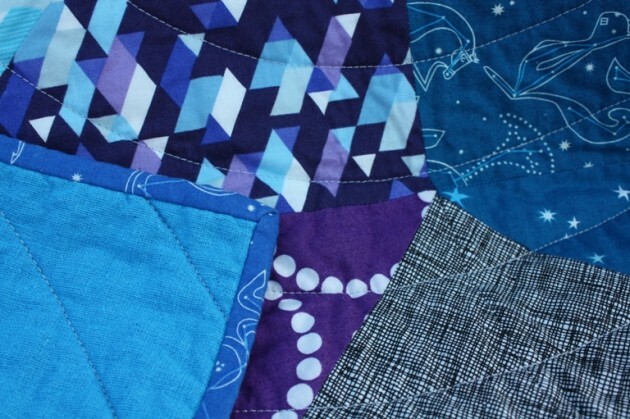 By the way, the 'Purple' constellations fabric is not purple at all, but blue. Why they named it purple I'll never know! 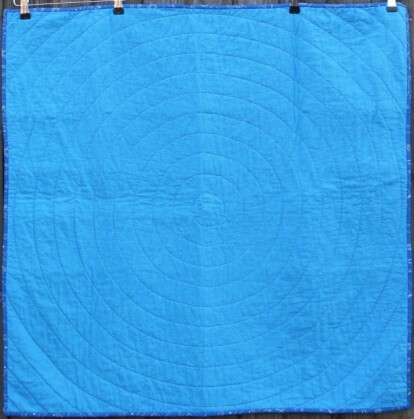 Quilted using the tried and tested, all time favourite, circles method... 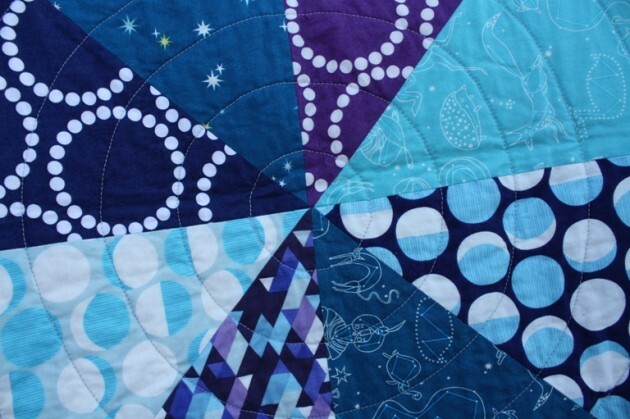 I did actually stray from this method for my last quilt (yet to be blogged) but it was such a pig of an experience by comparison that I came crawling back to circles. 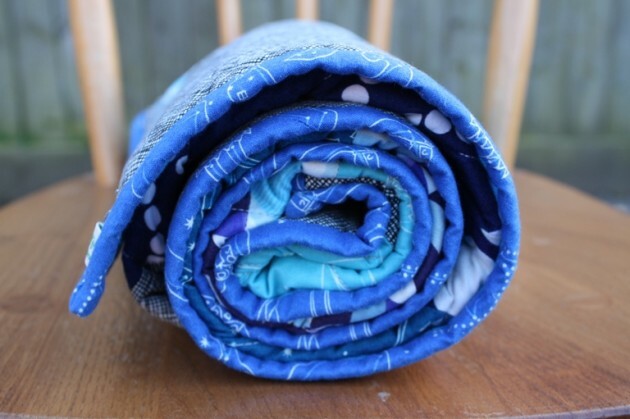 I actually made two of these at the same time, in a production line, backing the other with the Loganberry linen, but I shipped that off to the aforementioned carpet baby before I had time to take pics of it. This blue version is destined for the next baby that popped out just a week ago. This is a great idea for a quilt pattern. It really showcases the prints and is dead quick to put together. I should think I'll be making more of these as my friends do keep producing babies.